One of the toughest things to do in fantasy football is balance metrics with film evaluation. Welcome to the Rushing Expectation series, which does just that. You can read more about the Rushing Expectation methodology and signature metrics here. It’s a great time to be Cleveland sports fan. Imagine that. The Cavs finally got Cleveland its long-awaited major sports Championship, and then NFL commissioner Roger Goodell conditionally reinstated perhaps the league's most polarizing player, Josh Gordon. Though relevant, Gordon is not the primary narrative to focus on while forecasting the impact running back Duke Johnson will have on the Browns offense in 2016. In each of the last four seasons, new offensive coordinator Hue Jackson has led his offense to a top-seven finish in rushing attempts and touchdowns. Jackson's offenses have finished outside of the top-seven in total rushing yards just once over that time period. In each of the last ten seasons, Jackson has averaged a higher percentage of run plays than all but three active play-callers in the NFL. You will not find an offensive coordinator in the league more consistent in their pass/run splits, and he has never led an offense ranked lower than seventh in rush attempts. No running back has ever accounted for 60% or more touches in a Jackson offense -- he seems to be willing to rotate his backfield through defined roles. The best way to visualize this is how he treated the Giovani Bernard and Jeremy Hill committee in Cincinnati. That being said, a lot of times a running back's workload depends on game script and not a coordinator’s wishes, which is why a lot of people have high projections for Johnson’s passing game statistics. Vegas predicts absolute carnage for this team in 2016, and the reality is that the gravitational pull of Gordon when the Browns are behind will be significant. This is where Gordon has historically done his best work, dominating garbage time in 2013. The addition of Gordon, and increased competition for targets thereafter, does hurt Johnson’s value in the passing game. We also could be underestimating the role that Gary Barnidge, who is coming off of a breakout season, and first-round pick Corey Coleman will have as check-down options for RGIII. They will both undoubtedly be involved plenty, even after Gordon’s return in Week 5. If it is indeed RGIII under center, the run-heavy approach may even be more heavily weighted, limiting the amount of available targets. The primary tight end option for Jackson has accounted for at least 22% of their team’s red zone targets over his past four seasons. His number-two option has also always seen a large share targets, so Jackson is almost certain to make an effort to keep Barnidge involved. They did pay him, after all. Johnson will have a role in the passing game, that much we know. But whether or not he can he can dip even slightly into Isaiah Crowell’s carries this year is what matters most -- not whether Gordon can rip through more defenses than bowls in 2016. Johnson is not a running back who will blow you away with power and size, but he is also not the prototypical speedy space player who relies solely on his rare athletic ability, either. 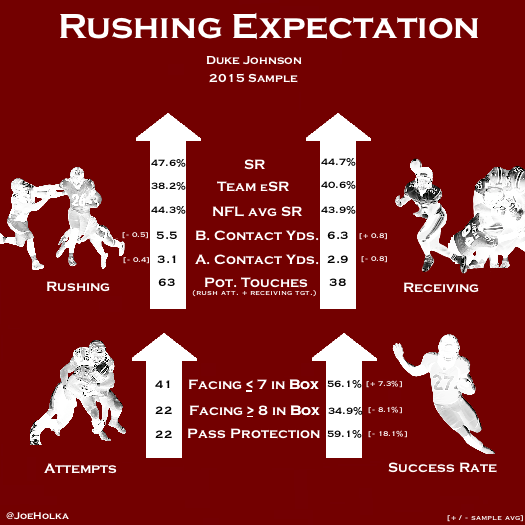 Johnson's largest distribution of rushing attempts was charted at 58.7%. These carries came through the middle lane, which includes runs behind the center, left guard, or right guard. Johnson has shown very good mental processing skills and instincts behind the line of scrimmage. He rarely misdiagnoses how he should approach a given situation or opportunity. Johnson’s chart shows he is one of the league's most involved backs in the passing game of my entire initial 20-player Rushing Expectation sample. He consistently makes plays through the various avenues and types of routes. Johnson's receiving skills are rare and he has very good hands, continuously proving he can catch the ball in difficult areas of his catch radius. In the early weeks of this methodology, I will continue to stress that my favorite and most useful metric is Expected Success Rate (eSR) metric. I strongly believe that not every Success Rate (SR) is created equal, and I think eSR does a great job highlighting this fact. Offensive lines show a direct correlation to running back success, but running backs still exceed or fall below expectations depending on skill. Though not perfect by any means, eSR does its best to separate offensive line talent from running back talent. You can learn more about this metric in my introduction video or article found here. It should be clear so far that I am a fan of Johnson’s talent from a film evaluation perspective. The question is, did he exceed or fall below expectation in 2015 from an efficiency or metrics point of view? 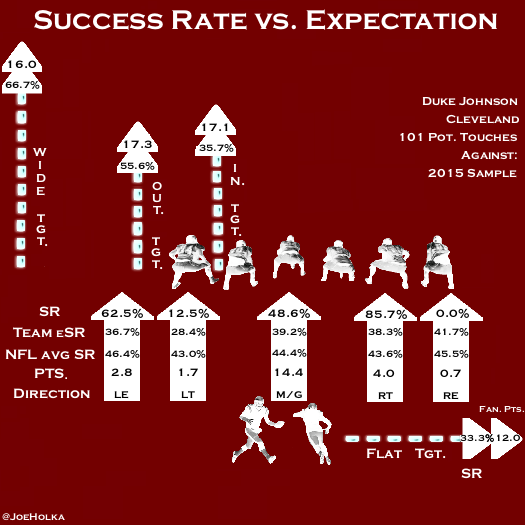 The overall eSR for Johnson and the Browns was 38.2% per rushing attempt, the fourth-lowest in the league and well below the NFL average of 44.3%. Cleveland was equally unimpressive in pass protection, boasting the fourth-worst overall expectation of any team at 40.6% eSR per target. Per attempt, Johnson was most successful through the lane behind the right tackle with a SR of 85.7%, though it was only 11.1% of his total rushing sample size. Johnson was 9.4% above his team expectation through his largest sample size, the middle lane. It is noteworthy, however, that the Browns did lose star center Alex Mack to the Falcons in free agency this offseason. 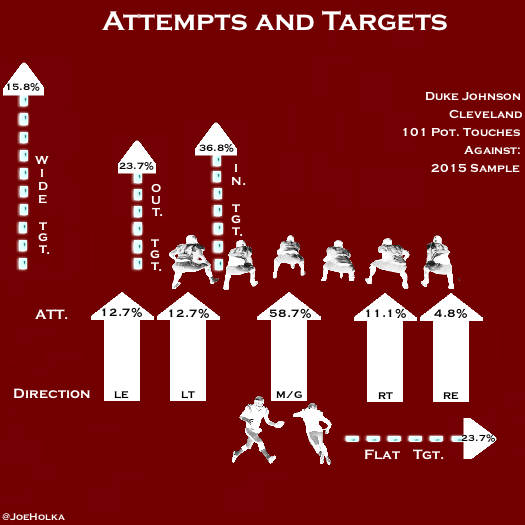 Per target, Johnson found the most success with targets out wide, at 66.7%, though just those and his outside targets finished above his eSR of 40.6% per target. His wide SR per target was the second-highest of my entire 20-player initial sample, trailing just Charles Sims (70.0%). Let's jump into Johnson’s overall Rushing Expectation results to see if they support my grades and film evaluation. Behind statistically one of the worst offensive lines in the league, Johnson performed above expectation in his 2015 sample by 9.4% in the run game and 4.1% in the passing game. These numbers put him just behind David Johnson in the top half of my initial 20-player sample. Neither player cracked my top five above expectation per attempt or per target overall. Before Contact Yards are something I discuss at length in my introduction. Elusiveness behind the line of scrimmage is an extremely underrated but prevalent ability among the league's best feature backs. Johnson’s before contact yards (rushing) of 5.5 per carry were below average in my overall results. This is surprising to me, as I found Johnson to have very good elusiveness behind the line of scrimmage. I rarely saw him bounce runs outside on inside run concepts. I found him to have very good lateral agility and a rare ability to find small creases to avoid contact in tight spaces. Johnson's long speed is merely above average, but on tape he appeared to have elite burst and acceleration, which also contributed to why I found his lack of success in before contact yards troubling. While Before Contact Yards is not completely reliant on offensive line skill, this is an instance where I believe Johnson's numbers could drastically improve if he were not running behind one of the worst units in the league. On the other hand, Johnson’s underwhelming Yards After Contact numbers cannot be blamed on offensive line play. He averaged 3.1 yards after contact (rushing) in his 2015 sample, which tied him for fourth-worst of my initial 20-player sample. Johnson's strength is good, but he has to pick his spots better when he attacks defenders as a smaller back. I found his finishing ability to be average, but not poor by any means. He needs to get back to his college days where he showed much better balance off of initial contact. Johnson had a 22.9% worse SR facing eight or more in the box than when he faced seven or fewer. This was the second-worst deviation of my 20-player sample, and just slightly better than Melvin Gordon (22.9%). In pass protection, Johnson's overall results were below average (59.1% success), but going into his second year, it is fair to be optimistic that he will improve. I did find his technique to be above average, and his positioning to funnel players away from danger and hand placement is good, which helps his case as a smaller back. It is completely possible that if RGIII is the Browns' starter, defenders will have to commit at least one player to respect his running ability, which could help negate Johnson’s lack of success with eight or more in the box. Alfred Morris rarely faced a loaded box in his Washington days with RGIII for this reason, and Johnson’s SR against seven or fewer in the box is spectacular (56.1%). Speaking of RGIII in his Washington days, per PFF, he was third in the league on yards/attempt on screen passes. While this is something he may have to do quite a bit of this season playing behind a poor offensive line and most people think this favors Johnson, I tend to disagree -- only 26.4% of RGIII’s total yards through screen passes went to running backs. Intuitively, this could change with how effective Johnson is as a pass-catcher, but we already know that coach Jackson likes to use his receivers and tight ends in the short-to-intermediate passing game. Coincidence maybe, but something to keep in mind. Johnson out-snapped Crowell 568-to-483 in 2015, and Johnson's college resume suggests he is capable of taking on more carries. If he gets that opportunity, I do believe he has the talent to flourish as a three-down back. However, it is squarely in the realm of possibilities that Johnson's opportunities cap out as a change-of-pace back, or as purely a passing down back. If that happens, it is indeed time to temper expectations. 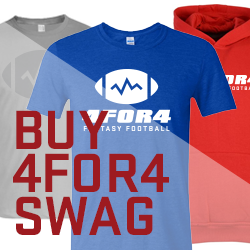 Johnson could easily turn into the fourth receiving option on a bad team when Gordon returns in Week 5. Coming off of just two touchdowns (both receiving) in his rookie season, Johnson's touchdown upside is likely to be severely capped again, as he will almost certainly defer to Crowell at the goal line. So if Johnson loses more targets in the passing game than we initially feared, look out. Contrary to popular belief, unless he can find a way into more opportunities between the tackles, Duke Johnson could be a sober Josh Gordon season away from a step back in 2016.